Expertly arranged down the centre of the Rook & Raven gallery, Paul Fryer’s Crystal Hydromorph series is a stunning collection of ten handmade sculptures in Murano crystal, evoking jelly fish or undiscovered life forms – they ignite our curiosity to explore these otherworldly entities in closer detail. 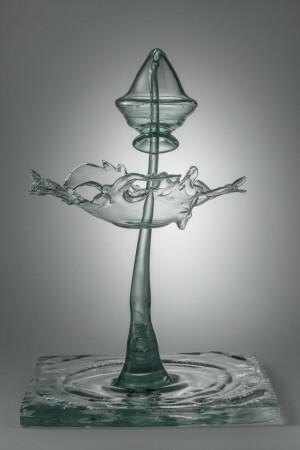 As their titles suggest, the surrealist liquid pieces are crystal manifestations of water, falling and hitting to form translucently unique and simply mesmerising forms. Fryer, a globally respected London based artist known for iconic pieces (such as Evening Star 2006, an actual mini star in a jar), has once again expertly combined his trademark passion for both religion and science into some painstaking and thought-provoking pieces. Stand directly in front of Be Not Afraid and the image is lost (it looks more like an elaborate stone tile rather than art), however, step to either side and see nature emerge from within the carved block of Italian limestone, using fractional shadows to create lines and ultimately images – a bee, chemical symbols, faces and even a front page materialise from these stone blocks adorning the walls of this practically monochrome and meditative space. Continuing the interaction and based on Powell and Pressburger’s 1946 classic movie A Matter of Life and Death, Paul Fryer’s Leaving Heaven is an animated lenticular print depicting the infamous heavenly staircase and rushed figure trapped between, as it’s the only piece transmitting a sense of urgency the dynamic clearly stands out against an otherwise calming collection. Downstairs in the sister gallery, a sudden onslaught of pulsating colour and light couldn’t be more juxtaposed. Your God Here is a disorienting and flashing LED instillation, reminiscent of whirling Christmas lights, if stared at too long the retinas do begin to beg for mercy. Always exploring themes from polarising viewpoints, and unorthodox to say the least, Fryer’s latest waxwork Queen of the Sea, Protect your Children is truly breathtaking – waxwork being a medium for which Paul is widely known. Our ethnic monarch portrays both the primitive and ethereally beautiful, while suffering is also clearly expressed by her being roped at the arms and ankles to distressed planks of painted wood. This utterly lifelike queen – so realistic you almost expect it to move and ask for a break and a beverage – with wild flowing Afro hair (very Diana Ross) vibrant body art and adorned tribal bangles, beads and shells is an engrossing masterpiece to his more intimate yet highly recommendable exhibition.